Teal Bon Chef Salad Dressing Ladle - Thousand Island, 11 1/2 inch -- 1 each. Our Pewter Glo collection is hand crafted from aluminum alloys that are rated 100% food safe. From broiler to stove-top direct to table, this is the handsome and cost efficient way to serve sizzling entrees. Equally dependable for keeping salads crisp and chilled, award-winning Pewter serving platter, Pewter soup bowls and Pewter serving ware is as versatile as you. All Pewter Glo products carry our lifetime body guarantee against breaking. Great for double sided cooking and serving. 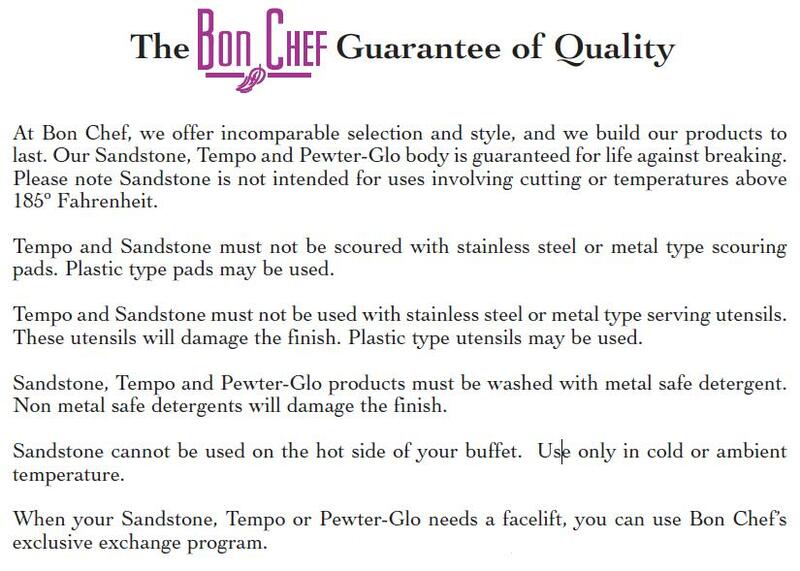 bonchef.com provides a huge combination of quality and style. Add elegance to your any event. Browse through our exclusive collection of pewter serving ware and buy them either as a gift or use them on your own table to impress your guests!!! Our Sandstone collection consists of bowls, crocks, trays and platters that look like fine china, but are unbreakable. They look like ceramic bowls but are durable, unbreakable and maintain consistent food temperatures. Our Sandstone is NSF approved and is virtually unmatched in maintaining uniformity and temperature. Our Sandstone platters, crocks and bowls look like fine china, but are actually-manufactured from specially formulated materials that are fired and fused to a 100% food-safe metal body.